The Tampa Bay Estuary Program and its executive director received top awards at the recent Future of the Region Awards luncheon in St. Petersburg. This was the 24th year of the awards program, sponsored by the Tampa Bay Regional Planning Council. 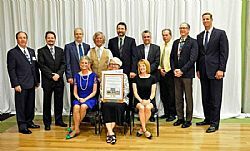 TBEP's successful intergovernmental partnership to restore the bay's seagrasses was given the ONEBay McIntosh Award as the overall winner of the competition, which highlights projects, programs and individuals whose contributions benefit the regional community. The McIntosh Award recognizes the principals of the ONEBay Livable Communities vision and is named after the late Charles A. McIntosh, Jr., a true statesman who dedicated a major portion of his life to improving the quality of life in the Tampa Bay region. TBEP's innovative partnership of local governments, scientists and citizens has played a major role in restoring seagrasses in the bay to 1950s levels -- a goal that was surpassed in 2015. TBEP Executive Director Holly Greening received the Herman Goldner Leadership Award for her outstanding leadership of the TBEP partnership. The award is named for the four-term Mayor of St Petersburg who was a founding father of the Tampa Bay Regional Planning Council. Holly has been with the Estuary Program since its inception in 1991, starting as Senior Scientist and becoming Executive Director in 2008.